We discovered it when my mom and I were making a fancy vegetarian torte topped with these lovely slices of sweet potato draped and arranged like a big flower. We had slices left over and baked them with a tiny bit of olive oil until crispy. We were surprised we had never made sweet potatoes like this before and polished off the pan of crispy slices in a quick minute. Now it’s my go-to appetizer–it’s healthy and can be made quickly, and I usually have a sweet potato or two on hand. It’s also a good little project if one of your guests arrives early and is willing to be put to work peeling and slicing sweet potatoes. The trick is to cut thin slices and to give them some space on the roasting pan so they can get crispy. The dip is also simple and quick to prepare if you have harissa, which you can make or buy at ethnic markets and some natural foods stores. 1. Heat oven to 375 degrees. 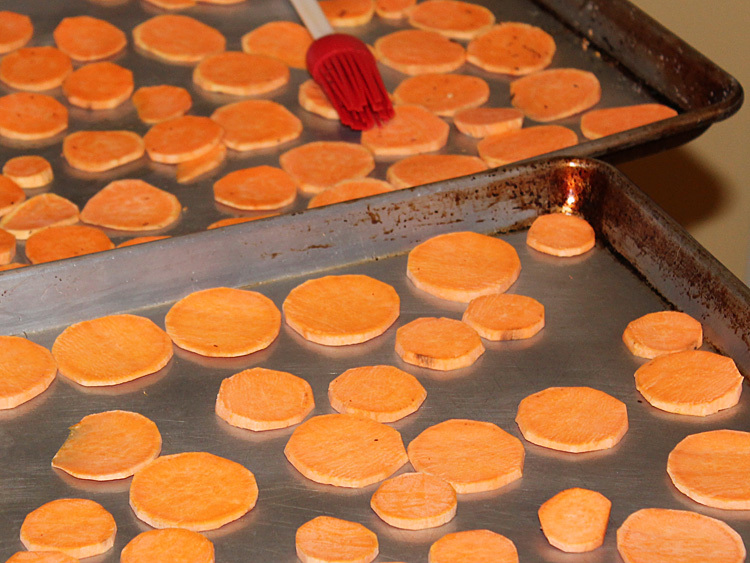 Peel sweet potatoes and cut them into 1/8-inch thick slices. 2. Brush 2 baking pans with the oil, lay the sweet potato slices on the pans, and brush them with the oil remaining on the brush. Sprinkle generously with salt. Be careful to not crowd the slices–they will crisp up better if the slices are not too close together. 3. Bake the sweet potatoes for 10 minutes, and turn them over. Check after 8 minutes, and continue baking until they are crispy. Timing varies and will depend on your oven. 4. 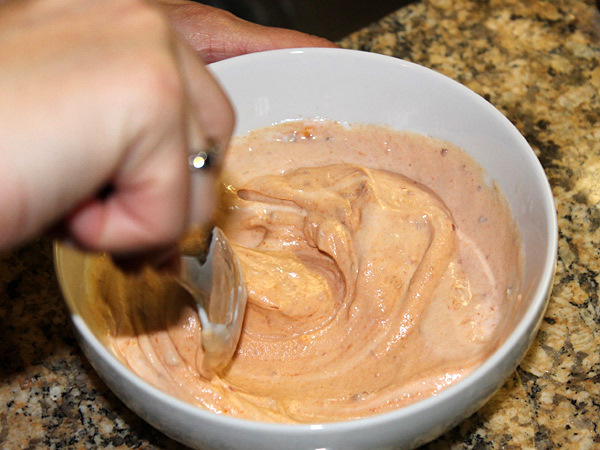 Serve warm or at room temperature with yogurt harissa dip or dip of your choice. Combine all ingredients and taste, adding more harissa if you like a zestier dip. 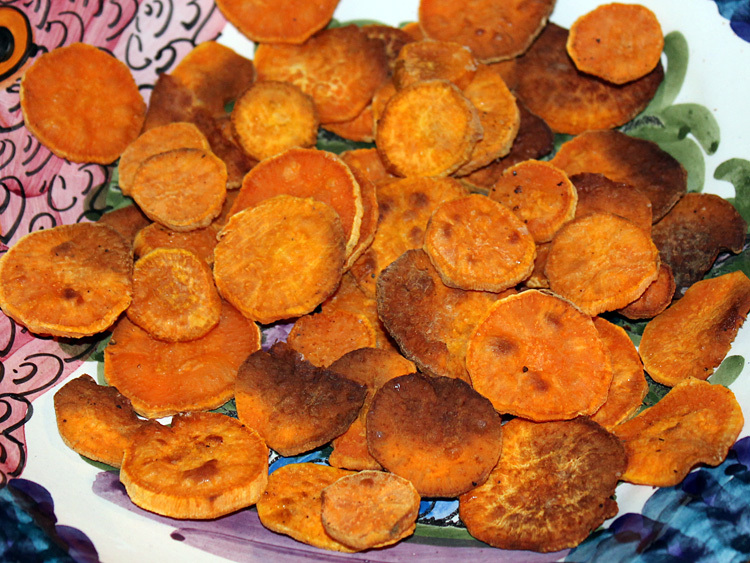 This entry was posted in Appetizers, Healthy, vegetables, vegetarian and tagged easy to make appetizer, sweet potato chips, sweet potatoes by Amy. Bookmark the permalink.